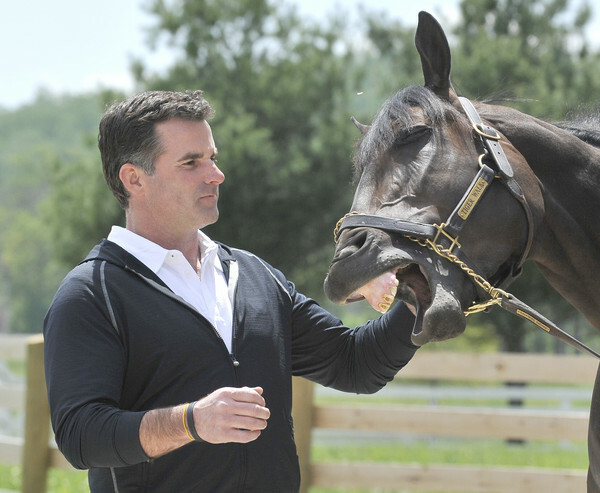 Given the company’s click-clack courtship with Auburn, it hardly seems a coincidence (surely Tubs taught him some Auburnisms in those early days) that the name of Under Armour founder and CEO Kevin Plank’s race horse is, that’s right, Tiger Walk. Plank is apparently trying to as mighty a mark in horse racing as he has in athletic apparel—he recently purchased legendary breeding farm Sagamore Farms from the Vanderbilt family—and hopes Tiger Walk will be his Cam Newton. The Baltimore Sun says the thoroughbred is “pointed toward The Preakness” and is apparently Plank’s best bet for regularly competing in the Triple Crown. The question for Auburn fans is: Who would you root for in a race—Tiger Walk or Toomer’s Corner? Photo via The Baltimore Sun, h/t Brad Warner. Related: Toomer’s Corner comes in second by a nose. I wonder how bad he needs to pee.